So my girls are still heavily into horses, and the Olympics did not help matters any. 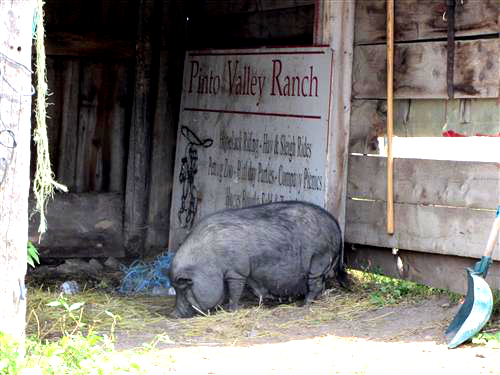 So to (hopefully) further dissuade them against the whole idea, I took them out to Pinto Valley Ranch. The ranch is located in Fitzroy Harbour, which makes it a bit of a hike - it's about 1/2 hour north of Kanata. What makes it worth it, though, is that it's one of the few places around where amateurs can have a go at horseback riding. They have several ponies on hand for younger kids. 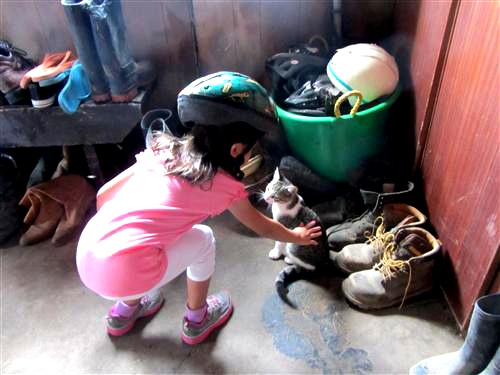 You can pick out a pony, then take a 10 minute or 20 minute ride around the paddock - your pony will be guided on the ground by an experienced rider, and your child will just be able to get the feel of a gentle walk and enjoy visiting with the horses. Once you hit 11 years old, you're old enough to qualify for their trail rides. 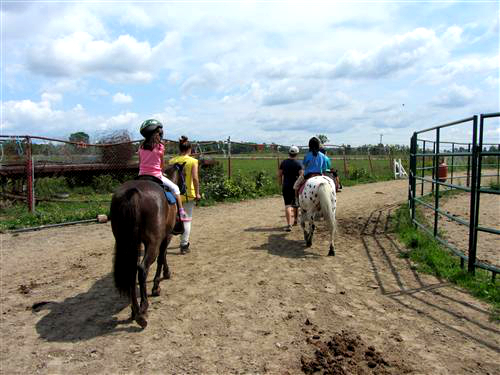 The trail rides are for all levels of riders - their horses are seriously so gentle and easy that even total beginners will be safe and sound. 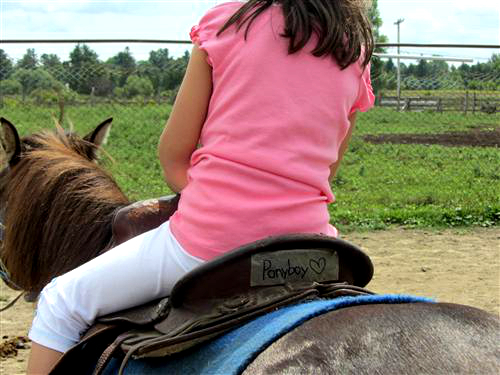 The horses and riders travel as a group along a pretty trail for about an hour, so you and your child can get a good feel for what it means to be on horseback. The ranch is a quiet, laid back kind of place. It's not like other in-town attractions, where you're running from one high-octane activity to the next. Besides the horse riding, there's nothing "to do," per se. But just being out on the farm was a surprisingly fun experience for the kids. 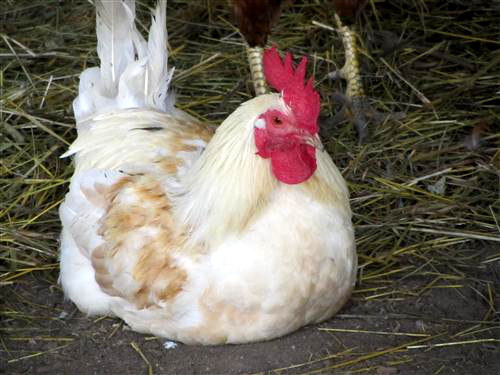 There are plenty of animals about - llamas and goats, funny loud roosters in a pen, pigs that are allowed to roam free (my kids LOVED them), kittens in the barn. If you're lucky, you might bump into a free-running peacock or two. You're free to walk up and down the stalls in the barn, too, visiting quietly with the horses, stroking then on the nose, imagining you own one and it sleeps in your bedroom and you ride it to school every day and Mommy, can I please please please have a horse??? There's a small tuck shop where you can sit inside and have a snack, and buy treats or drinks. There's plenty of outdoor toys for little ones to explore. It's quite pleasant to just sit and enjoy the barn smells and sounds. A slow-going afternoon in the country, if you will. We were there for about 2 1/2 hours total - enough time for a pony ride, a snack, a visit with the other animals...and then another pony ride. I am a sucker. If you are at all interested in the ranch, now is the time to go, and I mean like now, today. The ranch is facing some hard times right now - first of all, the drought this summer has caused a massive hay shortage in the area, and the ranch is looking at selling up to half its horses to make ends meet. Secondly, the owners' kids are all in full day school now, so they're starting to wonder when (or if) it's time to hang up the saddles. It's too bad, as it's the perfect place to introduce a possible horse-loving child to these kind, gentle animals. Also I should mention, they have day camps all summer long where your child can spend a week learning basic horse handling skills in the summer; and in the winter, you can head on out for a sleigh ride (advanced booking required). So go, now, today, while you still have a chance to support this great local business. Some important details: The day camps run in the mornings, so the rides are only open to the public from 1 p.m. to 5 p.m. in the afternoons. 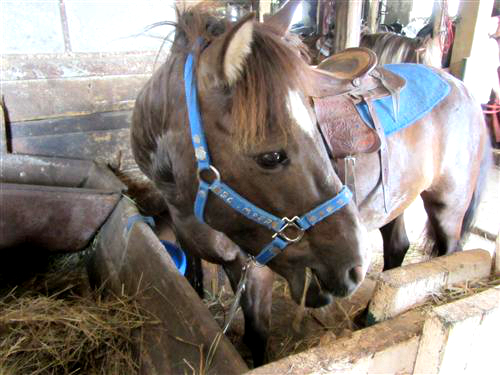 You can show up any time for a pony ride; trail rides run in the summer on this schedule. IMPORTANT NOTE: if the temperature is above 30 degrees, rides for that day are cancelled due to the weather being too dangerous for the animals. They're open every day in the summer, then Thursdays through Sundays for September and October. 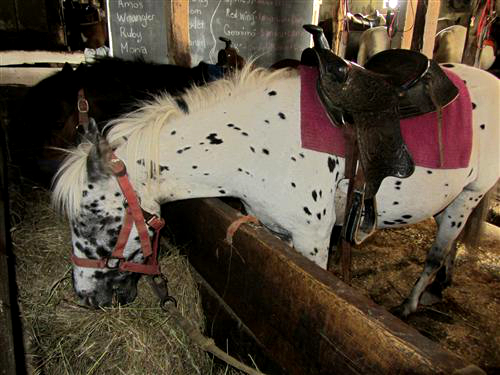 The pony rides are $10 for 10 minutes, $20 for 20 minutes; trail rides are $40 per rider (no double riders allowed). A wee bit expensive, but it's the only expense you'll have there, and it was SO worth it to my girls. 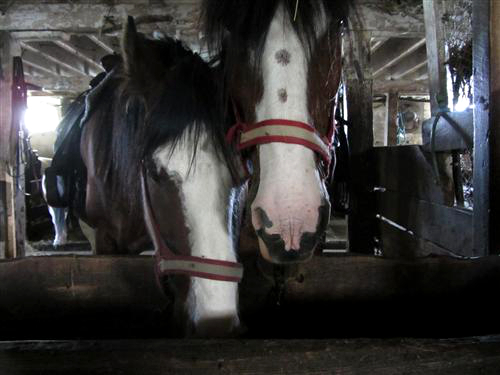 Shout out to Ponyboy and DotCom - best horses ever. You'll live forever in my daughter's dreams.